If we want to find if a value in a cell is even or odd, we can use the excel ISEVEN function. This function returns TRUE when the numeric value is even, and FALSE if it is odd. 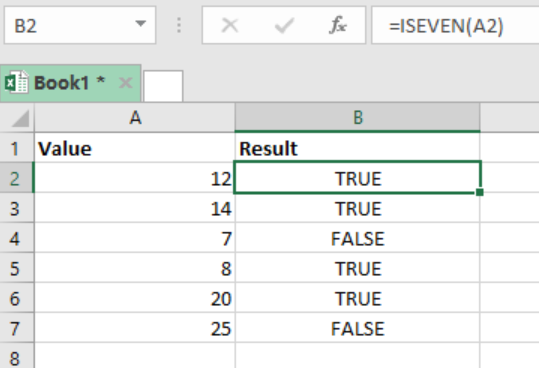 This post provides a clear guide on how to use the excel ISEVEN function to get even and odd numeric values in excel. The ISEVEN function helps us to check if a numeric value is an even number. This formula returns TRUE if the numeric value is even, and FALSE if it is odd. We then press Enter, to get the result. After we have the answer for cell B2, we copy the formula down to other cells to get the results. Note that if a cell does not contain a numeric value, the ISEVEN function will return a #VALUE error.